We’re going to answer one, brutally simple question — should you spend Rs 20 lakh on a Tata? ‘Wait, what? That’s a Tata?’ - our team exclaimed when we first saw the Concept H5X at the 2018 Auto Expo. That feeling lingers on as we soak in what the Harrier has to offer, while spending some time with it. So, has Tata Motors pulled a rabbit out of the hat? Has it truly developed a premium SUV that you and I would happily spend Rs 20 lakh on? Let’s answer these questions. If there’s one word we’d want to sum up the Harrier in, it’d be ‘striking’. There’s no way you’re missing one as it passes by. Especially if it’s finished in the signature ‘Calisto Copper’ shade. And, if the colour doesn’t arrest your attention, the size surely will. We see Tata taking a slightly different route here. While most manufacturers have resorted to making a vehicle taller to emphasize on size, Tata has stuck to the basics, by making it long and wide. The Harrier dwarfs compact SUVs such as the Creta, Duster and Captur. In fact, it manages to outsize vehicles like the Mahindra XUV500, Hyundai Tucson and even the Honda CR-V. Thanks to the lower height, the Harrier has a purposeful, squat stance. The gently sloping roofline, flared wheel arches and the high-set bonnet makes sure that it looks the business. To ensure it means it, though, there are some questionably bold design choices. The headlamps aren’t where you’d usually see them, daytime running lamps take that spot instead. These slender all-LED strips also doubles up as turn indicators. The actual headlamp cluster sits on the bumper, and houses a projector setup for the low beam with Xenon lamps. High beam duties are handled by regular halogen bulbs. If you’re wondering whether the low-set headlamps affect the beam/spread, the answer is yes. We’d have really liked the beam to be pointing slightly upwards. Even with the leveller set to the highest possible setting, the low beam felt like it was pointing a bit too downwards. High beam, on the other hand, is spot on. Move to the side, and there’s an underwhelming moment here. Those wheels? Seriously? We understand your disappointment. Even the Tigor and Nexon pack in swanky looking machine-finished design. This set of 17-inch wheels looks a tad too simple for the car. If not a bigger size, Tata could’ve surely chosen a livelier design. It’s also only here that you’d find chrome, although the usage is minimal. You see a strip outlining the window, and two small dollops on the door handle. The floating roof effect is apparent, and we’re sure a dual-tone colour scheme would look smashing on the Harrier. Another interesting detail here is that the doors extend over the skirts. This not only ensures a cleaner profile, but also ensures that the running board has better chances of survival in case of side-on impact. From the rear, the resemblance is strong with the Concept H5X. Connected tail lamps might become a Tata signature in the near future, and the Harrier is kicking the innings off in style alright. No, the central portion doesn’t light up - it’s a simple gloss black trim. The LED tail lamps, however, look swell, especially at night. We aren’t too kicked about the centrally placed Harrier badging though, and there’s no variant badging either. For that tough SUV look, Tata has also thrown in faux skid plates at both ends. Couple that with the short overhangs and the 205mm of unladen ground clearance, and you’ve got an SUV that has plenty, and we mean plenty of road presence. Among the first things you’d notice about the Harrier’s cabin, is that you don’t have to climb into it. The floorboard is relatively low, so one can simply walk into the cabin. Both the front and rear doors open wide enough to let you get in and out easily. Once you’re seated in the front seat, you get the feeling that you’ve been cocooned by the cabin. While the seating position is tall, the window line is roughly at shoulder level. So, you might not get that feeling of sitting above traffic immediately. For you to get comfortable, the driver’s seat on the top-spec Harrier can be adjusted eight-ways (lower trims get 6- and 4- way adjustable seats respectively), and the steering too can be adjusted for rake and reach. But, there is a bit of problem here, especially for those with long legs. A portion of the dashboard hits the left knee when you’re using the clutch or the dead pedal. The solution to this is to slide the seat behind a couple of notches, and then pull the steering towards yourself. While this does negate the knee-brushing problem, it ends up amplifying another bugbear - blind spots. From the driver’s seat, a fair portion of the sidewards view is blocked by the thick A-pillar. Another sizeable chunk is obstructed by the oversized wing-mirror. The thick D-pillar will add to your U-turn woes, and the small rear windscreen doesn’t let you see much either. Tata, we know you’re reading this, give us a 360° camera, please! Save for this, the front seat is actually a comfortable place to be in. The seats are supportive, and the added lumbar support does help over a long road trip. For the price, we think Tata could’ve thrown in a powered driver’s seat, and maybe even seat ventilation. Storage spaces are well thought of too. You get a large bottle holder and an umbrella holder in the front doors, along with some more space for you to throw in some knick-knacks. The glovebox too features a separate shelf to house the car’s documents. There’s some more under the central armrest (which we think is placed slightly further back than it should’ve been) which you can use to store some soda cans. Since the storage space is chilled, your cold drink will remain cold too. It also houses the only 12V socket in the whole cabin. Tip: use a small charger so you don’t take up valuable real estate inside the cubby. There are cup-holders behind the funky aircraft style handbrake too. Just make sure you order a small coffee, because a large can is most definitely going to get knocked over by the handbrake when it’s engaged. There’s one last cubby for your phone, in front of the Terrain Response selector. And that brings us to the last problem with the Harrier’s cabin. At first glance, you’d struggle to find the USB and the AUX slots. And when you eventually do, you will struggle to slot in your pen drive, AUX cable or connect your phone via USB. You really have to bend down, and since no one ever slots a USB drive in on the first try, this can get quite frustrating. At the rear, this problem gets worse. It’s placed completely out of sight, and it’d take you some time before you spot it. Slotting your USB device in requires you to have patience. Good news is that it’s a 2.4A socket that will charge your phone pretty quickly, and there’s a cubby for your phone to rest in while it juices up. Bad news is that it’s the only slot for three rear occupants. In an age where everyone is staring at a screen, this should’ve been thought of better. But, when you aren’t looking at your phone, you can keep it safely in the shelf on the rear door designed specifically to hold it in place. There’s some more space on the door pad including a 1-litre bottle holder. Finally, you get two cupholders in the rear central armrest. Should you choose to not use that chunky central armrest, you can genuinely seat three people in the rear bench. The floor hump too isn’t intrusive, which means there’s space for the middle occupant’s feet. Tata has also ensured that the seat base is flat, and the armrest sits flush with the seat back to make sure the third occupant isn’t hassled here. As far as space for the other two occupants goes, it’s plenty. Two six-footers can sit comfortably behind each other with some kneeroom to spare. The seatback is set at a neutral recline, which should feel relaxing for most. However, we’d have liked to see a reclining rear seat for that added touch of comfort. We’ve got no complaints with the headroom either, it’s ample. Bootspace too, feels enough for an SUV this size. At 425 litres, the boot is just 5 litres smaller than that of the Jeep Compass. You also get a 60:40 split, and the option to fold the second row flat to the floor. And that, opens up a healthy 810 litres of space. Yes, the Harrier’s cabin isn’t perfect. It has some hiccups here and there. But you’d learn to make peace with it. What you’ll certainly love from the word go, is the way it looks. The design is clean, minimal, and simple. Something, we believe, will age gracefully over time. Tata has opted for a tried-and-tested layered dashboard with a soft-touch top portion, an oakwood finish in the centre, and deep metallic grey finisher. Paired with the floating touchscreen, and a straightforward button layout in the centre, it makes for a pretty sight. There are some neat elements here too, like perforated leather on the floor console, on the door handles as well as the elbow rests. Not to mention, the leather on the seats too feels rich. There’s smooth leather on the steering and around the gear lever as well. All of this really begs a question - is this really a Tata? They seem to have levelled up. And by a significant margin at that. As you’d expect from a flagship, the Harrier is Tata’s best-equipped car till date. The usual premium car goodies including climate control, automatic headlamps, rain-sensing wipers, a parking camera and rear-AC vents are obviously present. Weirdly, there are some surprising omissions too, such as an auto-dimming rear view mirror and the all important sunroof. Also, small features such as front parking sensors and an electric tail gate would’ve elevated the experience to the next level. For us, the piece de resistance is the 7-inch display in the instrument cluster. The TFT screen has sharp graphics and offers a host of information. A permanent member of the screen is a digital tachometer. You get to cycle between five readouts - distance to empty, instant fuel efficiency, trip A details, trip B details and power/torque pie charts. And thankfully, there isn’t an ugly stalk on the instrument cluster to control this. You can toggle through the menus using the buttons on the steering wheel. What’s more, the screen also displays important information like the music that’s playing, which door is open, status of cruise control and other warnings such as speed limit. When your phone is connected to Android Auto, the screen also shows the next instruction from Google Maps. It would have been seriously cool if it pulled up a mini map on the screen! The ‘other’ screen on the dash, is an 8.8-inch touchscreen. For the moment, it only supports Android Auto, while Apple CarPlay is in the works. We had no issues with clarity or response times. That said, it did reboot a couple of times during our drive. We’re hoping this is a concern only with our pre-production test vehicles, and the ones you buy won’t have this issue. We also like the fact that there are physical buttons underneath the screen, that don’t require you take your eyes off the road. You get two knobs - one for volume, and the other for seek. The second knob will also let you zoom in and zoom out of Google Maps when your phone is connected via Android Auto. Sweet! All this is paired with a stellar music system from JBL. It has eight speakers and one subwoofer, taking the total tally up to nine. What’s more is, there’s an external amplifier as well. And, expectedly, this setup is lipsmacking. There’s no audio system that comes remotely close to this one at this price point. None whatsoever. Even when it’s cranked up to maximum volume, there’s no distortion or cracks in the audio output. Powering the Harrier is a 2.0-litre diesel engine from the Compass. But, here it’s about 33PS down on power, at 140PS. Torque, however, remains identical to the Jeep at 350Nm. All this power is sent to the front wheels through a 6-speed manual transmission, also borrowed from FCA. With 1675kg to lug around, the motor does have its work cut out for it. Does it deliver? Short answer: it does. At no point do you feel there’s a dearth of power. The engine and gearbox combination feels very versatile. Something that’s at ease inside the city, and at home on the highway. There are drive modes to go along with too: Eco, City and Sport. And no, they aren’t gimmicks. You will actually pick on an immediate sense of sluggishness the moment you switch from Sport to City or City to Eco. If it were left to us, we’d drive the Harrier in Sport mode all the time. The surge of torque that kicks in at ~1800rpm is satisfying, but never scary. In this mode, it’s an absolute rockstar on the highway, chomping down miles without breaking a sweat. Since there’s no protest from the engine even if you’re in high gear at low speeds, you can really pull from 50kmph to 150kmph in top gear. Even if you choose to overtake on a whim, you have enough torque on tap to let you step hard on the accelerator and get past the car in front. Inside the city, be sure to switch to the namesake mode. With Sport, you’d find yourself reaching for the brake often because a small dab on the throttle makes the car lunge forward. Within the urban environment, you can practically drive it in third gear all day long. It doesn’t mind dropping under ~20kmph in third, so you can tackle speed breakers and drive away in the same gear. Admittedly, we didn’t spend too much time in Eco mode. It dulls out throttle response to the point where we wanted to switch back to at least City mode if not Sport. But, hey, it will keep your wallet fatter. If you’re willing to make that trade-off, then you will find Eco mode useful as well. A big positive here is that the clutch and the gear action never gets taxing. Sure, the clutch isn’t featherlight, but it won’t bother you in a bad jam either. Gears slot in positively, too. And considering you don’t have to fiddle with it now and then, is a plus. Those wanting an automatic would have to wait for at least six months. And for those awaiting an all-wheel drive version, don’t hold your breath. It might never happen. Tata simply doesn’t see enough demand to make one. But, there’s a consolation in the form of Terrain Response. Yes, Land Rover has tech by the same name. Think of this as a simple ‘entry-level’ version of the same. You get two modes - Rough Road and Wet. These modes are ESC-based, and they work by changing throttle maps. While on a gravelly patch of road, we found the Rough Road mode limited the amount of power going to wheels. Is there a negative to the drive experience? Yes, there is. While Tata has gone the extra mile and insulated the cabin by using a double-layered firewall, you still hear a lot of the engine, a lot of the time. There’s simply no running away from the gruff note of the motor. What’s worse is that it becomes more and more prominent as the revs climb. Our second complaint would be of vibrations, especially at idle. The gear lever, steering, pedals and floorboard seem to buzz with excitement. Vibrations are almost negligible once you’re on the move, though. 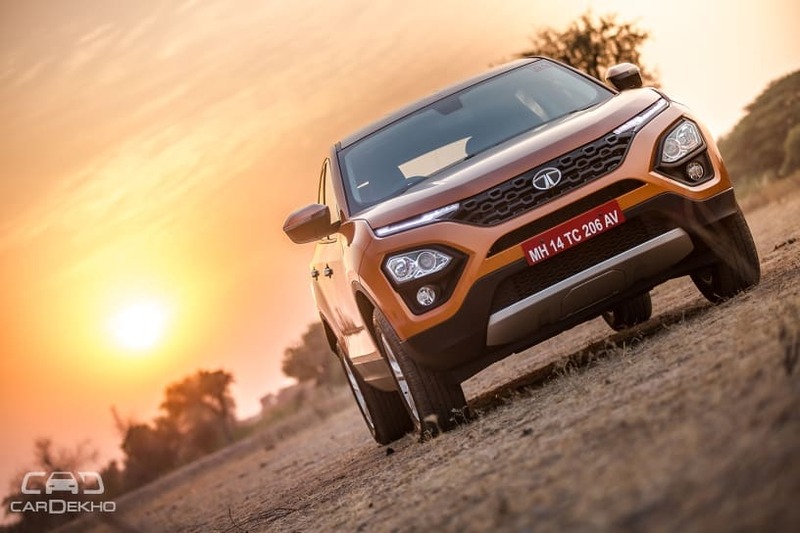 Tata’s Harrier borrows the front suspension from the Land Rover Discovery Sport. However, the rear suspension has been changed to a more pocket-friendly semi-independent twist blade setup, that has been tuned by Lotus Engineering. For the most part, the SUV does well in keeping potholes and broken roads at bay. It’s appreciable that it does this without making a noise. Over large bumps, though, you will feel a side-to-side rocking motion inside the cabin. Rear seat occupants too will feel like they’re being tossed about. An easy way to overcome this, is to take it really (and we mean really) slowly over the big speed breakers and large craters. On the highway, the Harrier is in its element; remaining rock steady at speeds cops asked you not to do. And it’s this unfazed nature that makes us believe that the Harrier will be a great road trip companion for a small family. As far as the steering is concerned, yes it’s heavy. Not Hexa heavy, though. It shouldn’t be a bother inside the city, and you’d appreciate the weight out on the highway too. The Harrier is also quick to change directions. And once you change lanes quickly, it’s quick to regain composure too. For a car this size, the steering is surprisingly predictable. You can drive it through bends at a brisk pace and not sweat at the end of it. We say brisk because there’s some predictable body roll. So, it’s best to not get carried away when you encounter the ghats. Take it easy, and enjoy the drive. That’s what this one is all about! The top-spec Harrier gets a host of safety tech. This includes six airbags, ABS with EBD, ISOFIX child seat mounts, Electronic Stability Program (ESP) and Electronic Traction Control. And because it has ESP, Tata is offering a string of software-based safety tech like hill hold control, hill descent control, rollover mitigation and disc brake wiping. But, do note. ESP is offered only on the top-spec XZ variant. This means all the safety tech you’d want in a car this size is limited to that variant too. Weirdly enough, ISOFIX child seat mounts aren’t offered as standard either. Not done, we think. Also, all other variants except the top has to make do with dual front airbags. You can pick between four variants of the Harrier - the XE, XM, XT and XZ. The base-spec XE feels a bit bare. It also misses out on quite a few features which we think are necessities such as front fog lamps and a music system. It’s also available in a single ‘Orcus White’ paint shade. The XM variant gets some feel good features such as drive modes, a 7-inch touchscreen and steering-mounted audio controls. Next on the list, the XT, ups the ante with 17-inch alloy wheels, automatic climate control, cruise control, push-button start, and automatic headlamps and wipers. For all the bells and whistles (and especially the safety package), we’d tilt in favour of the top-spec XZ variant. Tata has priced the Harrier really well, which, in our opinion sweetens the deal a whole lot. The best bit is that you don't really have drain the wallet to get a decently specced variant either. Let’s circle back to the original question, then. Should you and I happily cut a cheque of around Rs 20 lakh for a Tata? Yes, you should. Tata’s big gamble has finally paid off.